The donor and recipient surgeon(s) decide which renal unit will be used for transplantation. ■ When the kidneys are equal in size and function and have favorable vascular anatomies, the left kidney is selected to take surgical advantage of the longer left renal vein for recipient surgical implantation (4). 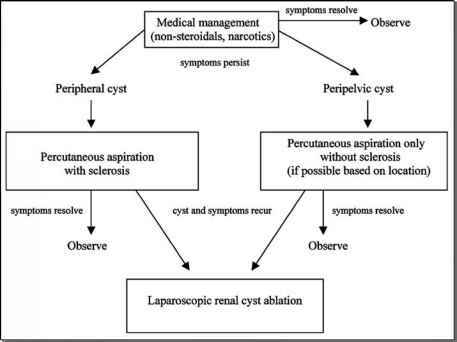 ■ Selection of the right kidney is based on traditional criteria independent of the laparoscopic approach. ■ When deemed a good candidate for donation, the patient is left with the "better" kidney if a discrepancy exists. Additional considerations include the donor's body mass index and prior abdominal surgical procedures. Laparoscopic donor nephrectomy has been performed safely in obese patients. Donor and recipient outcomes have been similar to those seen in nonobese donors (18). Therefore, obesity is not a contraindication for laparoscopic donor nephrectomy. Patients who have undergone extensive prior intra-abdominal surgery, especially in close proximity to the proposed operative field, are still considered candidates for renal donation but may benefit more from a retroperitoneal approach, either laparoscopic or open. Informed consent should be obtained from the donor surgeon. All potential complications are discussed, with ample opportunity for the donor patient to ask and receive answers to questions. The potential for open conversion is discussed. It is made clear to the patient that the primary responsibility of the surgical team is to ensure patient safety and procure a healthy allograft suitable for transplantation. If either of these objectives is compromised during the laparoscopic approach, conversion to traditional open surgery may be necessary. The donor patient is also educated about living with a solitary kidney. Although there is no need for major dietary or other lifestyle modifications, these patients should avoid contact sports and have serum creatinine and blood pressure monitoring in the perioperative period and then yearly. Patients are advised to maintain a clear liquid diet the day prior to surgery. No preoperative bowel preparation is necessary. Pneumoperitoneum decreases renal blood flow; so vigorous intravenous hydration is necessary to maintain urine output.